Suzuki R., Matsumoto H., Teshima T., Koyama H. Clinical assessment of systolic myocardial deformations in dogs with chronic mitral valve insufficiency using two-dimensional speckle-tracking echocardiography. J Vet Cardiol. 2013 Mar;15(1):41-9. OBJECTIVE: The objective of this study was to clinically assess myocardial deformations in dogs with chronic mitral valve insufficiency (CMVI) using two-dimensional speckle-tracking echocardiography (2D-STE). ANIMALS: 87 dogs with CMVI. METHODS: Dogs were placed into 1 of 3 classes, based on the International Small Animal Cardiac Health Council classification. In addition, 20 weight- and age-matched healthy dogs were enrolled as controls. The dogs were examined for myocardial deformations using 2D-STE, and strain and strain rate in the longitudinal, circumferential, and radial directions were evaluated. RESULTS: Class II and III dogs had higher circumferential strain than class I dogs (P = 0.002 and P = 0.001, respectively) and controls (P < 0.001 and P < 0.001, respectively). Class III dogs had higher radial strain than class I dogs (P = 0.001) and controls (P < 0.001). Class III dogs had higher radial strain rate than class I dogs (P = 0.006) and controls (P = 0.001). Other deformations, including longitudinal deformations, were not significantly different between classes of CMVI or between CMVI dogs and controls. CONCLUSIONS: In the clinical progression of CMVI in dogs, myocardial deformations, as assessed by 2D-STE, differed according to myocardial contractile direction. Thus, assessments of multidirectional myocardial deformations may be important for better assessment of clinical cardiac function in dogs with CMVI. Furthermore, 2D-STE allows for the assessment of myocardial deformations in all possible segments of LV myocardium and in 3 directions: radial and circumferential contraction in short-axis planes and longitudinal contraction in long-axis planes. This ability to measure myocardial motion in three directions may be important in dogs with severe MR because chronic LV remodeling may have different effects on LV short- and long-axis functions, as has been reported when using 2D-STE in humans with severe MR.12 Changes in myocardial deformations associated with progression of chronic mitral valve insufficiency (CMVI) in dogs have not been assessed. This study was designed to quantitatively measure multidirectional myocardial deformations of dogs in various stages of chronic mitral valve insufficiency (CMVI). Our hypothesis for this study was that myocardial deformations assessed by 2D-STE could be useful markers of systolic dysfunction in dogs with CMVI. We examined 87 client-owned dogs with chronic mitral valve insufficiency (CMVI). We also examined 20 weight- and age-matched healthy dogs serving as controls. These dogs were presented for cardiac screening at the Veterinary Medical Hospital of Nippon Veterinary and Life Science University in Japan and were investigated retrospectively. Dogs already treated by a referring hospital, with the exception of dogs receiving pimobendan treatment, were allowed to enroll in the study. The dogs were clinically diagnosed with CMVI using a previously reported echocardio- graphic method.2 We included dogs with mitral valve prolapse, mitral valve leaflet thickening as determined by 2D echocardiography, and MR as determined by color Doppler examination. We excluded dogs that presented with congenital heart disease or other acquired cardiovascular disorders. None of the dogs included in the study had mitral endocarditis, as determined by clinical findings, and none of the echocardiographic images of the dogs showed large, heterogeneous vegetative lesions. All dogs underwent a complete physical examination, ECG, thoracic radiography, and transthoracic echocardiography. If indicated, complete blood counts and serum biochemistry were also performed to rule out systemic disease that might affect cardiac function. We excluded dogs with chronic mitral valve insufficiency (CMVI) that also had tricuspid regurgitation of >3.45 m/s as determined by Doppler echocardiography. Indeed, this regurgitant velocity is equivalent to a peak pressure gradient of >48 mm Hg, as calculated by the modified Bernoulli equation, and is indicative of moderate to severe pulmonary hypertension. In this study, given the influence of increased right ventricular pressure on LV motion, we excluded dogs with a right ventricular to right atrial systolic pressure gradient at or above 48 mm Hg that could not be improved by therapy lowering the left atrial load.13 A trained investigator (H.K.) classified all 87 dogs with CMVI into 1 of 3 groups, according to the International Small Animal Cardiac Health Council (ISACHC) classification.14 The dogs were placed into class I, II, or III based on owner responses to detailed questions and on thoracic radiographic and echocardiographic findings. Control dogs were healthy, with normal findings on complete physical examination, ECG, thoracic radiography, and transthoracic echocardiography. None of the control dogs had a history of cardiac symptoms. Conventional 2D, M-mode, and Doppler examinations were performed by a trained investigator (H.K.) using a Vivid7echocardiographic system3 and 3.5—6.9 MHz transducer. A simultaneous lead II ECG was also recorded. All data were obtained from at least 5 consecutive cardiac cycles in sinus rhythm from non-sedated dogs that were manually restrained in the right and left lateral recumbent positions. The images were analyzed by 4 trained observers using an offline EchoPac workstation^ The presence of mitral valve prolapse, mitral valve thickening, and MR was evaluated from the right parasternal approach and the left apical 4-chamber view. The left atrial to aortic root ratio (LA/Ao) was obtained from the right parasternal short-axis view using the B-mode method.15 M-mode measurements of the LV were obtained from the right parasternal short-axis view of the LV at the level of the chordae tendineae, according to the leading edge to leading edge method.16 These measurements included end- diastolic interventricular septum thickness, end- diastolic LV free-wall thickness, end-diastolic left ventricular internal dimension (LVIDd), end-systolic left ventricular internal dimension (LVIDs), and fractional shortening (FS). LV wall thickness was defined as the sum of the end-diastolic interventricular septum thickness and the end-diastolic LV free-wall thickness. As indicators of LV geometrical remodeling, relative wall thickness (RWT) and LV sphericity index (LVSI) were calculated as previously described. RWT is the ratio of the LV wall thickness to LVIDd,17 and LVSI is the ratio of LV long-axis diameter to short-axis diameter.18 Transmitral flow was obtained from the left apical 4-chamber view with pulsed Doppler sample volume placed between the tips of the opened mitral valve leaflets and was measured from the early diastolic wave (E wave) and late diastolic wave (A wave).19 Forward SV was calculated as the product of the aortic valve crosssectional area and the aortic valve outflow time- velocity integral.20 The cross-sectional area of the aortic annulus was calculated as pr2, where R represents half of the annulus diameter. The aortic valve annulus diameter was obtained from the right parasternal long-axis view with the zoom option using the inner edge to inner edge method.20 Forward SV was indexed to body surface area to determine the forward SV index (FSVI). Body surface area was derived from body weight using a previously published equation.21 In our analyses, we used the mean value of 3 consecutive cardiac cycles in sinus rhythm from high-quality images for each measurement. After completion of the conventional 2D, M-mode, and Doppler examinations, high-quality images for 2D-STE analysis were obtained by the same investigator (H.K.) using the same protocol, echo- cardiographic system, and transducer as described for the standard echocardiography. All 2D-STE views were recorded at 76.1 to 139.2 frames per second. We used a right parasternal short-axis view of the LV at the papillary muscle level to evaluate radial and circumferential deformations by 2D-STE. We used a left apical 4-chamber view to evaluate longitudinal deformations. Images were analyzed by 4 trained observers using the offline workstation. All observers were blinded to each dog’s classification and to any other examinations findings. We used previously published procedures for speckle-tracking analysis.6-8 We selected one cardiac cycle in sinus rhythm (from one QRS complex to the next QRS complex) from high-quality images and manually traced the endocardial borders of the myocardium to select the appropriate region of interest. The region of interest was then adjusted to incorporate the entire myocardial thickness and was checked by trained observers to ensure that it visually synchronized with cardiac movement throughout the entire cardiac cycle. The computer software automatically traced the myocardium and created 6 segments in each image. The software also automatically evaluated whether myocardial motions were reliably followed. If the initial evaluation failed because the region of interest could not be traced during myocardial movement, we retraced the endocardial borders and made corrections as needed. If multiple attempts at evaluation failed, the failed segment was excluded from analysis. Finally, we measured peak systolic global values of strain and the strain rate of each direction. We assessed aortic valve opening and closure using Doppler signals of the LV outflow. The mean value of measurements from 3 consecutive cardiac cycles in sinus rhythm from high-quality images were used for all analyses. Data were expressed as medians and interquartile ranges. All statistical analyses were performed using commercially available computer software.13 We used a Kruskal-Wallis test to assess the equality of medians among the 4 groups (controls, I, II, III). When the Kruskal-Wallis test indicated significant differences between groups, further comparisons were made using a Mann-Whitney U- test with Bonferroni’s adjustment. A value of P < 0.008 was regarded as significant. To examine correlations between 2D-STE values and heart rate, body weight, and age, a linear regression analysis was performed. A value of P < 0.05 was regarded as significant. We assessed 2D-STE interobserver variability by determining the coefficients of variation for all measurements of 2 groups of 5 randomly selected healthy dogs. Coefficient of variation was determined as the ratio of the standard deviation to the mean values. Intraobserver reproducibility was assessed by having each observer repeating 2D-STE measurements for 5 dogs selected at random from controls on a different day. The characteristics, clinical and conventional echocardiographic data for healthy controls and for dogs with chronic mitral valve insufficiency (CMVI) are summarized in Table 1. Age, body weight, and body surface area of dogs did not differ significantly among the 4 groups. The dominant breeds in each group were as follows: controls, Miniature Dachshund (6/20, 33%); class I, Shih tzu (5/45, 11%) and Miniature Dachshund (5/45, 11%); class II, Cavalier King Charles spaniel (8/32, 25%); class III, Miniature Poodle (3/10, 33%) and Chihuahua (3/10, 33%). None of the dogs included in class I or in the control group were receiving medical treatment at the time of examination. Thirty-four percent of the dogs in class II (11/32) and 40% of the dogs in class III (4/10) were receiving medical treatment from the referring hospital at the time of examination. Thirty-four percent (11/32) of the dogs in class II and 40% (4/10) of the dogs in class III received angiotensin-converting enzyme inhibitors. Twenty percent (2/10) of the dogs in class III received oral furosemide. Ten percent (1/10) of the dogs in class III received spironolactone. Thirteen percent (4/32) of the dogs in class II and 30% (3/10) of the dogs in class III received oral isosorbide dinitrate. After analysis using an offline EchoPac workstation, 1867 of 1926 (96.9%) segments for short-axis images and 1845 of 1926 (95.8%) segments for long-axis images were included in the statistical analysis. The interobserver coefficient of variation for 2D-STE measurements ranged from 1.6% to 6.5% for radial deformations, 6.4%-15.6% for circumferential deformations, and 7.5%-16.4% for longitudinal deformations. The coefficient of variation for intraobserver 2D-STE measurements ranged from 0.6% to 9.4% for radial deformations, 0.5%-10.7% for circumferential deformations, and 0.5%-6.5% for longitudinal deformations. The 2D-STE data for healthy controls and dogs with CMVI are summarized in Table 2. The dogs in class II had higher peak systolic circumferential strain (Circ S) than those in class I (P = 0.002) and controls (P < 0.001). Compared to controls, the dogs in class III had higher peak systolic Circ S (P < 0.001), peak systolic radial strain (Rad S; P < 0.001), and peak systolic radial strain rate (Rad Sr; P = 0.001). The dogs in class III had higher peak systolic Circ S, peak systolic Rad S, and peak systolic Rad Sr than those in class I (P = 0.001, P = 0.001 and P = 0.006, respectively). Other deformations were not significantly different between classes of CMVI or between CMVI dogs and controls. Peak systolic longitudinal strain rate (Long Sr), peak systolic circumferential strain rate (Circ Sr), and peak systolic Rad Sr were correlated with heart rate (Long Sr, p = -0.218, P = 0.032; Circ Sr, p = -0.200, P = 0.04; Rad Sr, p = 0.336, P = 0.001, respectively). Peak systolic Long Sr, peak systolic Circ S, and Circ Sr were correlated with body weight (Long Sr, p = 0.283, P = 0.005; Circ S, p = 0.207, P = 0.035; Circ Sr, p = 0.361, P < 0.001, respectively). No deformations were correlated with age. Myocardial circumferential and radial deformations obtained by 2D-STE were different in the dogs with chronic mitral valve insufficiency (CMVI) compared to controls, as well as in the dogs with progressive stages of CMVI. These deformations may have been altered by myocardial compensatory mechanisms against volume overload. Additionally, in the clinical progression of chronic mitral valve insufficiency (CMVI) in dogs, myocardial deformations differed according to the direction of myocardial contraction. Therefore, the determination of multidirectional myocardial deformations may facilitate clinical assessment of cardiac function in dogs with CMVI. In contrast, Circ S observed in class II was higher than that observed in class I dogs and controls but was not different from that observed in class III dogs. Circumferential deformations play an important role in cardiac pump function in people with cardiac disease27,28 and LV myocardial contractions that are impaired in the longitudinal direction are compensated for by circumferential shortening to preserve pump function in subclinical patients with cardiovascular risk factors.29 Therefore, higher circumferential deformation may be compensating for volume overload to preserve pump function. The proportion of fibers oriented circumferentially to those oriented longitudinally is approximately 10:1 in the normal canine myocardium.30 Circumferential deformation, more than longitudinal, may be involved in myocardial contraction due to fiber orientation. Additionally, because of the incompressible nature of normal myocardium, myocardial fiber shortening in the circumferential direction causes myocardial transformation perpendicular to the fiber direction (i.e., toward the center of the LV cavity), producing wall thickening. These concepts suggest that large circumferential deformation results in sufficient radial thickening to produce SV. In the present study, Circ S was not higher in class III dogs compared to class II dogs. 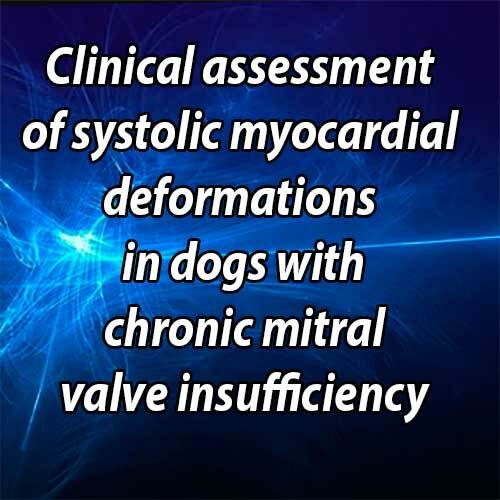 This result may be related to the lower forward SV and congestive findings in class III dogs, which result in the severe heart failure signs associated with class III chronic mitral valve insufficiency (CMVI). As indicated by RWT and LVSI, increases in wall stress and the abnormal distribution of myocardial fiber shortening in class III dogs may result in a more spherical LV relative to that found in class II dogs. This finding may contribute to the unchanged circumferential deformation we observed in this study. Unchanged Circ S may indicate a more severe degree of myocardial damage and subsequent progression of cardiac signs. Accordingly, the higher circumferential deformation demonstrated in our study may reflect compensatory myocardial motion and thus may preserve forward SV, thereby preventing serious cardiac symptoms in dogs with chronic mitral valve insufficiency (CMVI). In this study, radial deformations were higher in dogs with severe CMVI than in other groups. Past studies have postulated that sufficient combined longitudinal, circumferential, and radial deformations might contribute to effective SV.31 Given the lower FSVI and higher peak systolic Rad S and Rad Sr in class III dogs compared to dogs in other classes, higher radial deformations might cause a larger MR relative to the forward SV. An increase in radial deformation that is not accompanied by a further increase in circumferential deformation in dogs with severe chronic mitral valve insufficiency (CMVI) may be ineffective for cardiac pumping and might induce some of the severe clinical signs observed in class III dogs. Heart rate in class III dogs was also higher than that observed in class I dogs, and this finding correlated with some of the 2D-STE values. The high heart rate found in dogs with severe chronic mitral valve insufficiency (CMVI) could be associated with high sympathetic nervous system activity and may affect myocardial deformations, as assessed by 2D-STE. This study has several limitations. First, our study was retrospective, and more than one observer analyzed the echocardiographic data, which may lead to rather inconsistent results. Second, we could not consider the influences of medication on the values assessed by 2D-STE. Because this was a retrospective study and our hospital provided secondary medical care, many dogs had received some drugs prior to examination. These medications could affect myocardial performance, thereby complicating the interpretation of our results. Third, we obtained sphericity index data using 2D echocardiography on a single plane. This approach may not accurately assess the geometry of the LV. However, the use of healthy controls evaluated with the same ultrasound views and same protocols may allow reliable data comparison. Fourth, the assessment of moderate to severe pulmonary hypertension was dependent on detection of tricuspid regurgitation by Doppler echocardiography. It is therefore possible that some dogs with pulmonary hypertension but without evidence of tricuspid regurgitation were included in the analysis. The prevalence and severity of pulmonary hypertension in dogs with chronic mitral valve insufficiency (CMVI) increases during disease progression,13 and moderate to severe pulmonary hypertension is a common feature in ISACHC class III dogs. Because dogs with moderate to severe pulmonary hypertension were not included in the study, the results of this study may not reflect the natural history or disease progression of chronic mitral valve insufficiency (CMVI) in dogs. Finally, we did not investigate changes in the values of myocardial deformation over time in the same dogs or relate any changes to ISACHC class deterioration versus improvement. Circumferential deformation may play an important role in the preservation of forward SV in dogs with chronic mitral valve insufficiency (CMVI) . In the clinical progression of CMVI in dogs, myocardial deformation differed from myocardial contractile direction. The assessment of multidirectional myocardial deformations might improve the clinical assessment of cardiac function in dogs with chronic mitral valve insufficiency (CMVI). The authors wish to thank Tetsuya Uematsu and Ryu Sakurai for their technical assistance. Kittleson MD. Myxomatous atrioventricular valvular degeneration. In: Kittleson MD, Kienle RD, editors. Small animal cardiovascular medicine. St. Louis: Mosby; 1998. p. 297-303. Borgarelli M, Savarino P, Crosara S, Santilli RA, Chiavegato D, Poggi M, Bellino C, La Rosa G, Zanatta R, Haggstrom J, Tarducci A. Survival characteristics and prognostic variables of dogs with mitral regurgitation attributable to myxomatous valve disease. J Vet Intern Med 2008;22:120-128. Lim P, Mitchell-Heggs L, Buakhamsri A, Thomas JD, Grimm RA. Impact of left ventricular size on tissue Doppler and longitudinal strain by speckle tracking for assessing wall motion and mechanical dyssynchrony in candidates for cardiac resynchronization therapy. J Am Soc Echocardiogr 2009;22:695-701. Tidholm A, Ljungvall I, Hoglund K, Westling AB, Haggstrom J. Tissue Doppler and strain imaging in dogs with myxomatous mitral valve disease in different stages of congestive heart failure. J Vet Intern Med 2009;23: 1197-1207. Amundsen BH, Helle-Valle T, Edvardsen T, Torp H, Crosby J, Lyseggen E, St0ylen A, Ihlen H, Lima JA, Smiseth OA, Sl0rdahl SA. Noninvasive myocardial strain measurement by speckle tracking echocardiography: validation against sonomicrometry and tagged magnetic resonance imaging. J Am Coll Cardiol 2006;47:789-793. Edvardsen T, Helle-ValleT, Smiseth OA. Systolic dysfunction in heart failure with normal ejection fraction: speckle-tracking echocardiography. Prog Cardiovasc Dis 2006;49:207-214. Chetboul V, Serres F, Gouni V, Tissier R, Pouchelon JL. Radial strain and strain rate by two-dimensional speckle tracking echocardiography and the tissue velocity based technique in the dog. J Vet Cardiol 2007;9:69-81. Takano H, Fujii Y, Ishikawa R, Aoki T, Wakao Y. Comparison of left ventricular contraction profiles among small, medium, and large dogs by use of two-dimensional speckletracking echocardiography. Am J Vet Res 2010;71:421-427. Culwell NM, Bonagura JD, Schober KE. Comparison of echocardiographic indices of myocardial strain with invasive measurements of left ventricular systolic function in anesthetized healthy dogs. Am J Vet Res 2011;72:650-660. Smith DN, Bonagura JD, Culwell NM, Schober KE. Left ventricular function quantified by myocardial strain imaging in small-breed dogs with chronic mitral regurgitation. J Vet Cardiol 2012;14:231-242. Chetboul V, Tissier R. Echocardiographic assessment of canine degenerative mitral valve disease. J Vet Cardiol 2012;14:127-148. Paraskevaidis IA, Kyrzopoulos S, Tsiapras D, Iliodromitis EK, Parissis J, Farmakis D, Kremastinos DT. The role of left ventricular long axis contraction in patients with asymptomatic non-ischemic mitral valve regurgitation and normal systolic function. Int J Cardiol 2008;124:64-71.
International Small Animal Cardiac Health Council. Appendix A: recommendations for diagnosis of heart disease and treatment of heart failure in small animals. In: Fox PR, Sisson D, Molse NS, editors. Textbook of canine and feline cardiology. 2nd ed. Philadelphia: WB Saunders; 1999. p. 883-901. Rishniw M, Erb HN. Evaluation of four 2-dimensional echocardiographic methods of assessing left atrial size in dogs. J Vet Intern Med 2000;14:429-435. Sahn DJ, DeMaria A, Kisslo J, Weyman A. Recommendations regarding quantitation in M-mode echocardiography: results of a survey of echocardiographic measurements. Circulation 1978;58:1072-1083. Dini FL, Capozza P, Donati F, Simioniuc A, Corciu AI, Fontanive P, Pieroni A, Di Bello V, Marzilli M. Patterns of left ventricular remodeling in chronic heart failure: prevalence and prognostic implications. Am Heart J 2011;161: 1088-1095. Gomez-Doblas JJ, Schor J, Vignola P, Weinberg D, Traad E, Carrillo R, Williams D, Lamas GA. Left ventricular geometry and operative mortality in patients undergoing mitral valve replacement. Clin Cardiol 2001;24:717-722. Schober KE, Hart TM, Stern JA, Li X, Samii VF, Zekas LJ, Scansen BA, Bonagura JD. Detection of congestive heart failure in dogs by Doppler echocardiography. J Vet Intern Med 2010;24:1358-1368. Lewis JF, Kuo LC, Nelson JG, Limacher MC, Quinones MA. Pulsed Doppler echocardiographic determination of stroke volume and cardiac output: clinical validation of two new methods using the apical window. Circulation 1984;70: 425-431. Jacobs G, Mahjoob K. Multiple regression analysis, using body size and cardiac cycle length, in predicting echo- cardiographic variables in dogs. Am J Vet Res 1988;49: 1290-1294. Bonagura JD, Schober KE. Can ventricular function be assessed by echocardiography in chronic canine mitral valve disease? J Small Anim Pract 2009;50:12-24. Borgarelli M, Tarducci A, Zanatta R, Haggstrom J. Decreased systolic function and inadequate hypertrophy in large and small breed dogs with chronic mitral valve insufficiency. J Vet Intern Med 2007;21:61-67. Ljungvall I, Hoglund K, Carnabuci C, Tidholm A, Haggstrom J. Assessment of global and regional left ventricular volume and shape by real-time 3-dimensional echocardiography in dogs with myxomatous mitral valve disease. J Vet Intern Med 2011;25:1036-1043. Grossman W, Jones D, McLaurin LP. Wall stress and patterns of hypertrophy in the human left ventricle. J Clin Invest 1975;56:56-64. Burns AT, La Gerche A, D'hooge J, MacIsaac AI, Prior DL. Left ventricular strain and strain rate: characterization of the effect of load in human subjects. Eur J Echocardiogr 2010;11:283-289. Mizuguchi Y, Oishi Y, Miyoshi H, Iuchi A, Nagase N, Oki T. Concentric left ventricular hypertrophy brings deterioration of systolic longitudinal, circumferential, and radial myocardial deformation in hypertensive patients with preserved left ventricular pump function. J Cardiol 2010;55:23-33. Wang J, Khoury DS, Yue Y, Torre-Amione G, Nagueh SF. Preserved left ventricular twist and circumferential deformation, but depressed longitudinal and radial deformation in patients with diastolic heart failure. Eur Heart J 2008;29: 1283-1289. Mizuguchi Y, Oishi Y, Miyoshi H, Iuchi A, Nagase N, Oki T. The functional role of longitudinal, circumferential, and radial myocardial deformation for regulating the early impairment of left ventricular contraction and relaxation in patients with cardiovascular risk factors: a study with twodimensional strain imaging. J Am Soc Echocardiogr 2008; 21:1138-1144. Streeter Jr DD, Spotnitz HM, Patel DP, Ross Jr J, Sonnenblick EH. Fiber orientation in the canine left ventricle during diastole and systole. Circ Res 1969;24: 339-347. Cheng A, Nguyen TC, Malinowski M, Daughters GT, Miller DC, Ingels Jr NB. Heterogeneity of left ventricular wall thickening mechanisms. Circulation 2008;118:713-721.